Cinematographer. Nationality: American. Born: Denver, Colorado, 22 August 1892. Career: Worked as wireless telephone engineer and inventor; then film cameraman in middle 1910s; aerial cinematographer, and photographer of Red Cross documentaries during World War I; 1920—first feature film as cinematographer, Back to God's Country ; 1925–52—photographer for Columbia; involved in technical aspects of photography: invented the Double Exposure System, c. 1917, several zoom lenses (the earliest in 1929), Duomar Lens for motion picture cameras, 1931 (and for television cameras in the 1940s), the Variable Diffusion Device, 1931, and the Facial Make-Up Meter, 1941, as well as lightweight camera blimps and optical diffusion techniques. Award: Gordon Sawyer Award, 1980. Died: In Las Vegas, Nevada, 1 August 1985. "Danger in God's Country," in American Cinematographer (Hollywood), May 1985. With Juanita Walker, The Light on Her Face , Hollywood, 1984. Dusing, Lysa, in American Cinematographer (Hollywood), July 1981. American Cinematographer (Hollywood), March 1982. Obituary in Variety (New York), 7 August 1985. Obituary in American Cinematographer (Hollywood), October 1985. Joseph B. Walker's career could have flourished in any of a number of directions. His pioneering work in the development of the wireless transmitter with Dr. Lee DeForest gave him a head start in the new world of radio broadcasting. His lifelong fascination with the workings of motion-picture cameras led him to put his name to an impressive list of inventions: the first zoom lens patent, a comparator exposure meter, a panoramic television camera, and many others. But it was as cinematographer on some 160 feature films that Walker made his mark. After some years of freelancing as a newsreel photographer Walker shot his first feature, Back to God's Country , in 1919 on a formidable location near the Arctic Circle. For the next seven years he worked steadily at a variety of minor studios, occasionally with good directors like W.S. Van Dyke, Francis Ford, and George B. Seitz. More often Walker photographed low-budget programmers. His huge collection of camera lenses (and his intimate knowledge of their possibilities) made him invaluable to the directors of these quickies. Walker could, by changing lenses, shoot a close, medium, or long shot without moving the camera, thus saving precious time in shooting westerns like Fighting Courage or serials like Officer 444 . In 1927 Walker photographed The Warning , directed by Seitz, his first film at Columbia. Walker was to remain almost exclusively with this studio until his retirement in 1952. At the time, Columbia was the least of the majors; Walker, through his long association with Frank Capra, would help to change that. Walker found Capra a most congenial collaborator, a director who could at once keep a tight rein on his artistic vision while allowing Walker remarkable experimental leeway. Though Walker was a master at composition and elaborate camera movement, his most memorable images come from his brilliant mastery of lighting: Barbara Stanwyck and David Manners by the fireside in The Miracle Woman ; the delicate mists of the moonlit haystack scene in It Happened One Night ; the shimmering, Baroque visions of The Bitter Tea of General Yen ; the stunning torchlight funeral in Lost Horizon . 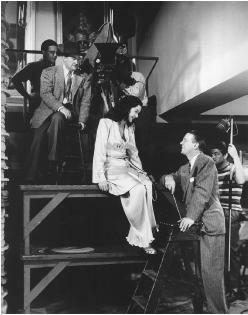 Though Walker's best work was with Capra, the cinematographer also had occasion to work with directors as diverse as Hawks ( Only Angels Have Wings , His Girl Friday ), Garnett ( The Joy of Living ), McCarey ( The Awful Truth ) and Schertzinger ( Love Me Forever , Let's Live Tonight ), George Stevens ( Penny Serenade ) and Alexander Hall ( Here Comes Mr. Jordan ). It's difficult, in fact, to come up with many first-rate Columbia films of the era on which Walker did not work. In his amiable and informative autobiography, The Light On Her Face , Walker quotes Columbia head Harry Cohn: "Y'know, there's one thing that's always made me curious about you. Practically every money-making picture we've had at Columbia, you've worked on it. How do you account for that? And don't tell me it's the photography! Photography doesn't sell pictures!" Maybe not. But those silvery images stay in the mind long after the movies' plots have faded from memory. The elegance of Walker's cinematography even survives the indignities of being shrunk down and contrasted out for television, though the delicacy of his lighting suffers on video. Walker, like many another of his gifted peers who worked predominantly in black-and-white, seem sadly relegated to a medium for which their work was not designed and which does not have the sensitivity properly to display the beautiful and precious images it chews up as so much fodder. But should the viewer have the willingness and the opportunity to return to Walker's films as they were originally intended—on 35 mm film—he or she will find that there were few more gifted practitioners of the art of cinematography. Wald, Jerry Wallis, Hal B.